Per tutti i secoli in cui esistette la Serenissima, fino alla caduta della Repubblica, il capodanno si festeggiò il primo marzo (e in effetti con questo sistema i mesi di settembre, ottobre, novembre e dicembre “tornano” al loro antico posto, come settimo, ottavo, nono e decimo mese dell’anno), e nei documenti ufficiali – allo scopo di evitare fraintendimenti con gli Stati in cui era in vigore il calendario gregoriano – la data era indicata con MV, more veneto, ovvero “secondo l’uso veneto”: in tal modo, per esempio, il 17 febbraio 1607 more veneto corrispondeva alla data generale 17 febbraio 1608, in quanto l’anno 1608 iniziava in Veneto solo a partire dal mese seguente e quindi nei possedimenti della Serenissima febbraio risultava essere l’ultimo mese del 1607. Since the time of the Serenissima, until the fall of Venetian Republic, the new year’s day has been celebrated on the 1st of March. (Thanks to this order, the numbering of the months of the year had become the same as in ancient times: september, october, novembre and december were respectively the seventh, the eighth, the nineth and the thenth month of the year..) In order to avoid misunderstandings, as other states used the gregorian calendar, in their official documents, dates were always followed by MV (more veneto which means”after Veneto calendar”). 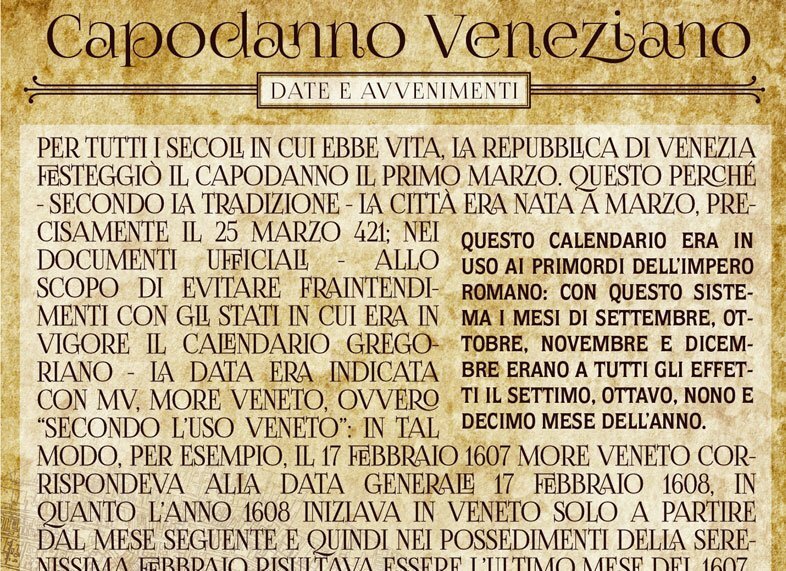 So, for example, the 17th of february 1607, More Veneto, in gregorian calendar was the 17th of february 1608. 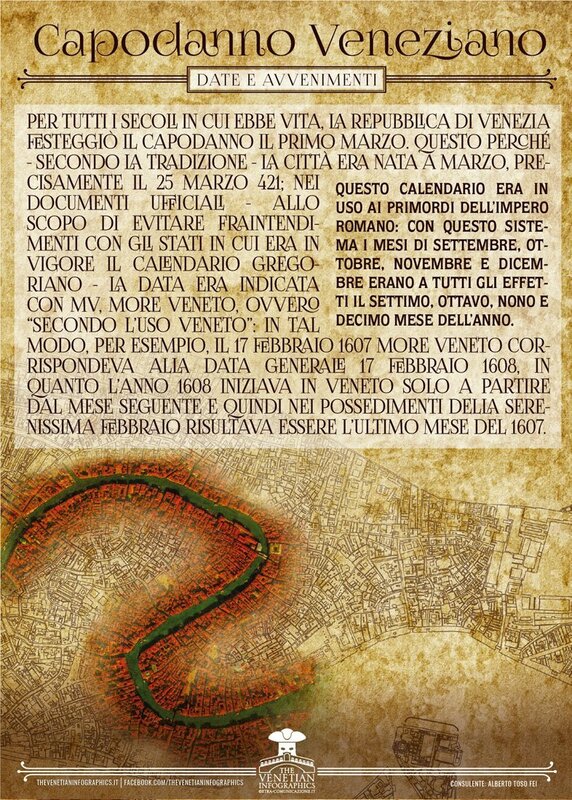 In fact, as the new year began in March, February was the last month of the year 1607, in all Venetian territories.